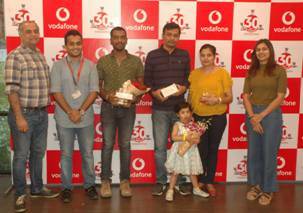 Vodafone India, one of India’s leading telecommunications service providers, announced and felicitated the 4 lucky winners of the contest ‘The 30 Day Pugathon’. Vodafone customers Pratik Kumar Krishnalal Dubey from Pune, Suraj Balekundri from Pune, Sachin Vyawahare from Latur and Baliram Shelke from Aurangabad were awarded the premium i-Phone 8. The 30 Day Pugathon was a month long national gaming contest available for all Vodafone prepaid and postpaid customers over its digital marketing storefront- My Vodafone App. The intuitive and customised interface of the app allowed the customers to surf through various pages and find the adorable Vodafone Pugs hidden on different locations. On collecting 7 pugs or more, the users were eligible for the ‘Super Apple Hamper’ worth Rs 2 lakh. Apart from the iphone 8 and Super Apple Hamper, customers also won an assured surprise gift with every pug they spotted. Everyday, one lucky winner stood a chance to win an iphone 8. My Vodafone App is a one-stop destination to manage your Vodafone account. Customers can visit the app and discover its in-built features and capabilities, like, track bill payments and recharges, get detailed real-time understanding of plans/packs, subscribe to new products, and much more.